Now time for some facts, some Arabian horses have five lumber vertebrae instead of the normal six, and seventeen pairs of ribs instead of the eighteen that is normally seen in other horses, out of the 205 bones in a horses skeleton 80 of them are located in its legs. 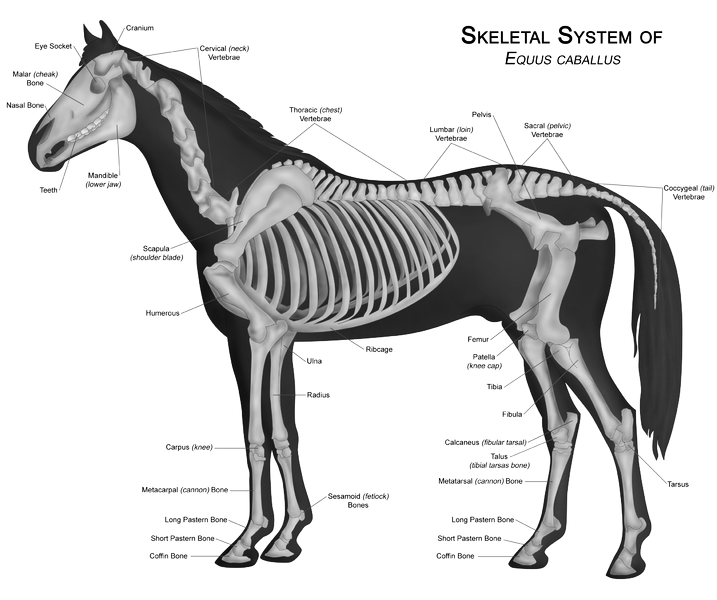 Anyway there is a lot about the horse’s skeleton but that will have to wait for another post, hope I didn’t bore you. That is very interesting..I wonder why some Arabian horses have only five? hi there- yes, I can see quite clearly that you're following my blog now with no problem- thanks so much! I liked your post about tack cleaning- yuck, how I hate it! Sherri, I really don’t know why Arabian horses have a different amount of bones, I know it affects their tail carriage but I don’t know why they have the different amount, I haven’t been able to find out. Ted and Bunny, oh good that it is all working now, and yes I too hate cleaning some tack it is so time consuming, but sadly must be done.